I have been writing quite a bit here on the Kindle critical update situation. I’ve noticed that I am still having a lot of hits on the blog looking for info about the need for updates for the older Kindles. What is interesting is the number of hits trying to verify whether this information is true or if it is some kind of spam or a scam. What’s this about updating pre-2012 Kindles? It seems that so many people have questioned whether or not this was a hoax, Snopes.com has finally weighed in on the topic. Snopes is pretty much the go-to destination on the web for debunking rumors. 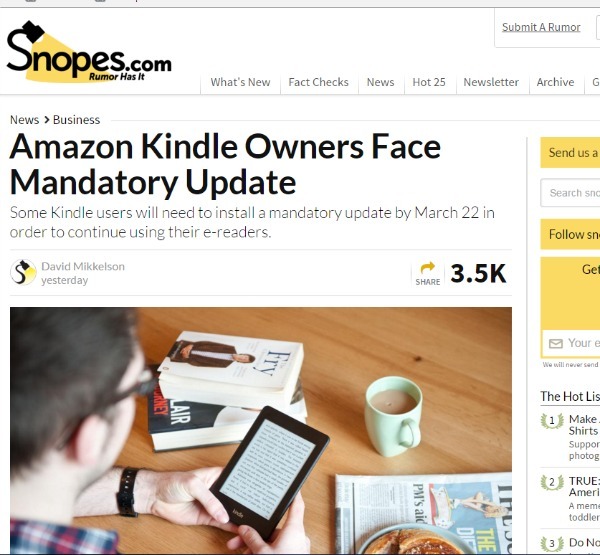 The article, Amazon Kindle Owners Face Mandatory Update, was published yesterday and verifies that yes, these emails and this update is indeed legit. This update is not required for every model of Kindle, but only those from 2012 and older. Customers who act before the deadline will face a relatively easy task: Kindle models from 2010 to 2012 can be updated via Wi-Fi, and models from 2007 through 2009 can be updated via the devices’ wireless connections. However, Kindle users who miss the deadline will have to update their e-readers manually, typically by downloading the software update to PC or other devices and connecting their Kindles to those devices with a USB cable. If you have been sitting on the fence about this, the clock is winding down. In order to update over the air via wi-fi, you must update by March 22nd in order for your device to be able to connect to Amazon’s servers and your library. After that date, you will have to connect to your computer using USB and install the update manually. Perhaps after all the updates are done, it might be nice to come back and revisit this topic and try to figure out why so many people thought that this wasn’t real. Is it being constantly deluged with emails from Nigerian princes and online pharmacies? It makes you wonder…. This entry was posted in Updates and tagged debunking, Kindle updates, rumor, Snopes. Bookmark the permalink.